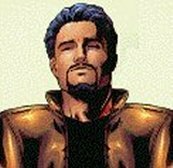 Stark, probably the world's greatest engineering genius, is also a philanthropist, and the financier who backs the mighty Avengers. News Flash! Toy Biz is releasing an "Official" Famous Covers Iron Man figure, in his Silver Age armor, with a newly sculpted Silver Age Tony Stark head! Below, the current image of Tony Stark, as drawn by Sean Chen. This is the version I based my Tony on. 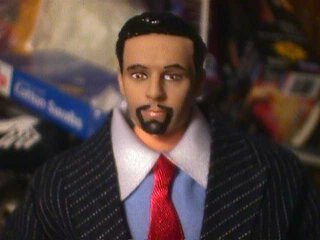 Below, my custom Tony Stark. 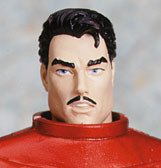 Below, courtesy of the Raving Toy Maniac's news page, is the upcoming Famous Covers Tony Stark head. Tony Stark is a Famous Covers Peter Parker body. 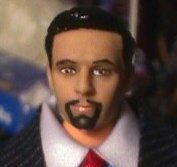 His head is a Playmates 9" "Dr. Julian Bashir," from Deep Space Nine. His eyebrows were wiped out with Acetone, and re-drawn, along with the mustache and goatee, with a Sanford "Rub-a-Dub" laundry marking pen.